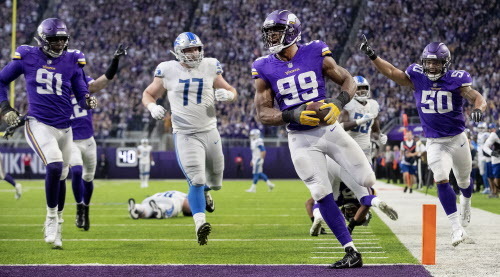 Danielle Hunter was recognized as the NFC’s best defensive player for Week 9 after spearheading the Vikings defense in a 24-9 win against the Lions on Sunday. Hunter had a career-high 3.5 of the Vikings’ franchise-record 10 sacks of Lions quarterback Matthew Stafford. The Vikings’ defensive star also added his second career touchdown on a 32-yard fumble recovery that sealed the win in the fourth quarter. It’s Hunter’s first NFC Defensive Player of the Week honor, becoming the eighth different Vikings defender to earn the recognition in head coach Mike Zimmer’s 4 1/2 seasons orchestrating the defense. Hunter, who just turned 24 years old on Oct. 29, leads the NFL with 11.5 sacks this season.